WHAT: CD featuring Idaho unsigned artists. Web site features drunk driving awareness ads created by students. WHO: Dave McIsaac, local musician. POCATELLO — Dave McIsaac has probably performed “The Devil Went Down To Georgia” more times than Charlie Daniels himself. When people visit the Web site, they are presented with drunk driving awareness messages and slogans designed by high school and college students. McIsaac has been performing professionally most of his life, including 15 years performing classical music for both the Idaho State and Idaho Falls Civic Symphonies. After college he decided to start performing country music, but found that getting a good paying job as a country music artist was challenging. “I really enjoy performing, but the only place you can do that is bars,” said McIsaac. The signed band he played in was offered free drinks when they performed, and McIsaac admits he got sucked into the cliché rock and roll lifestyle. Now sober for 19 years, McIsaac said participating in the Esente Music Group’s campaign against drunk driving was an easy decision. “I own kind of a debt myself. I got lost in that whole thing for many years. It just struck a note with me when they asked if I’d be willing to do that,” said McIsaac. When the original Charlie Daniels song was released the owner of the bar McIsaac was working for strongly suggested he learn how to play it — quick. “The first day they got in on the juke box the owner said ‘You gotta learn that song.’ So I was playing it the next week. I would play that song two, three, four times a night, and I did that for years,” said McIsaac. His wife’s brother-in-law, a music producer, encouraged him to write his own version of the song, so he did. “It’s real similar, but there’s enough difference in it that it’s its own separate song,” McIsaac said. Performing the intricate song was not difficult for McIsaac, who has been playing violin since the age of 6. “When I was five years old I asked Santa for a violin. I got a toy violin for Christmas and I smashed it because I wanted a real one,” laughed McIsaac. Not long after, McIsaac was given a real violin and had his first lesson on his sixth birthday. McIsaac has also been a studio musician in various places around the country, including Atlanta and Phoenix. The invitation to be featured on the Idaho Rockers 2010 CD came at the perfect time for McIsaac, whose new CD, “Clean Livin’” is tentatively set for release on Oct. 9. The album will be available on ITunes. 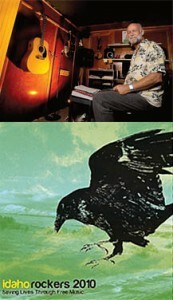 McIsaac has recorded, mixed and mastered the album himself in his home studio in Pocatello. Now that he has some experience under his belt he hopes to start producing the music of other local musicians. Find more information at his Web site at www.diddlerecords.com. The album’s title speaks volumes for McIsaac’s musical mission. “Anything I can do to help, it’s a no brainer for me,” he said.